The good news is that Utah is one of only six teams in the Pac-12 going to a bowl game. The bad news is that the Utes will likely be the last Pac-12 team invited to a bowl game, which doesn’t bode well for Utah fans’ holiday travel plans. As a farewell tribute to my daughter’s dashed dreams of a Rose Bowl berth (which would have meant a New Year’s trip to Disneyland for her), let me try and sum up the Utes’ season in Disney fashion. As Yogi Berra allegedly said, “It’s like déjà vu all over again.” The offense has been Utah’s Achilles’ heel for years. Whenever the offense plays up to the same level as the defense, this can be a dangerous team. Once again the defense acquitted itself quite well for the most part this year, but the offense consistently came up wanting. The game against Colorado was representative of what we have come to expect from the impotent Ute offense. Utah started the first, second and fourth quarters with back-to-back three-and-outs. In the fourth quarter, the Utes were only down by four points, but had back-to-back turnovers on their own side of the field, one of them being a fumble that was returned for what turned out to be the winning score. A total of five trips inside the red zone (and a sixth trip to the 27-yard line) yielded a grand total of 15 points. The special teams scored as many touchdowns as the offense. 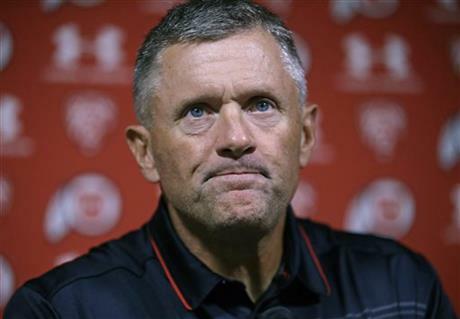 Kyle Whittingham’s Utes lost three out of their last four games to close the regular season. Utah goes through offensive coordinators like Murphy Brown used to go through secretaries, and it looks like it is time for yet another change. A quarterbacks coach who has actually played quarterback, or, at a bare minimum, has a history of being able to develop quarterbacks and get them to play at a level beyond their natural ability would also be nice. Inconsistent play from the quarterback has become the hallmark of an inconsistent offensive unit. In the six years that Utah has been in the Pac-12, a different team has represented the South Division in every conference title game. The only team not to do so? The Utes. Utah actually had a chance to play in the inaugural title game in 2011 — all they had to do was beat 2-10 Colorado, at home, no less. They didn’t. This year was a chance for some payback as the Utes had an opportunity to keep the Buffaloes out of the title game. They didn’t. If the Pac-12 champ doesn’t get a chance to play in the four-team national championship playoff, then as the sixth-place team, Utah will likely be headed back to the Las Vegas Bowl, again (big sigh). If the Pac-12 champ does get into the four-team playoff, then the Utes will get upgraded all the way to the Sun Bowl in El Paso, Texas. Call me crazy, but as tired as Utah fans are of driving to Las Vegas for a bowl game, I think even fewer would travel to El Paso. But the holidays are supposed to be a happy occasion, so let’s not bicker and argue about who killed who, or another near-miss by the football team. There are lots of good things happening on The Hill, and some other squads deserve some props. After both the football and basketball seasons ended last year (2015-2016), the baseball team won its first Pac-12 Championship and made it to the NCAA Regional. The softball team finished as the 16th ranked team in the nation, matching his highest final ranking in program history. Chrissy Glassman finished sixth in the javelin at the USATF Junior Outdoor Championships in late June. In late October, Dan Little captured the consolation singles title at the Intercollegiate Tennis Association Mountain Regionals. Meanwhile, Margo Pletcher and the doubles team of Jena Cheng and Taylor Calton all made it to the quarterfinals in the women’s Mountain Regionals. Just a few weeks ago the women’s cross country team finished 20th at the NCAA Championships for the highest finish in program history. One day later, the 23rd ranked women’s soccer team finally fell in the third round of the NCAA tournament, for the best postseason run in program history. The 17th ranked volleyball team will make its 13th NCAA Championship appearance this week. They play UNLV at the Smith Fieldhouse at BYU this Friday at 5 p.m. If Utah wins, then on Saturday they will play the winner of BYU and Princeton at 7 p.m.
Basketball season is now upon us, with the women’s team off to a 5-0 start, and the men’s team hot on their heels at 4-0. The men host Butler at home tonight with a 7 p.m. tip. Gymnastics is just around the corner, and the Red Rocks always give their fans something to cheer about. Here’s hoping Ute fans continue to have something to cheer about as we close out 2016 and enter 2017.